The video shows the image of Roger Moore strangling a blond woman with her bikini top projected onto the back and thighs of a lingerie clad woman. Jenna Corcoran created the video and is tells me about her marathon of watching Bond films to find these strange misogynistic images amongst the early films; thankfully diminished by the 1970s. “Goldmember,” Jenna says and then realizing her Freudian slip, “I keep saying that.” Easy to do the Bond films are one gigantic Freudian slip, the id projected onto a giant Cinemascope screen. On Friday night Brunswick Art Space opened two group exhibitions: “Bond Song” and “Posted from Nowhere (Or, What Have You Done For Me Philately? )” advertised the Fringe Festival Guide. Dapper Ive Sorocuk, a committee member at Brunswick Art Space had art in both exhibitions and was dressed for the Bond theme. His video played with the iconic opening credits with the gun barrel viewpoint. Brunswick Art Space has several comix artists on its committee, an unusual artistic direction for Melbourne’s art run spaces. “Bond Song” features art by Monique Barnett, The Chaotic Order, The Dark Carnival Dolls, Alister Karl, Max Piantoni, Genevieve Piko, Ive Sorocuk, and Jamie Rawls. 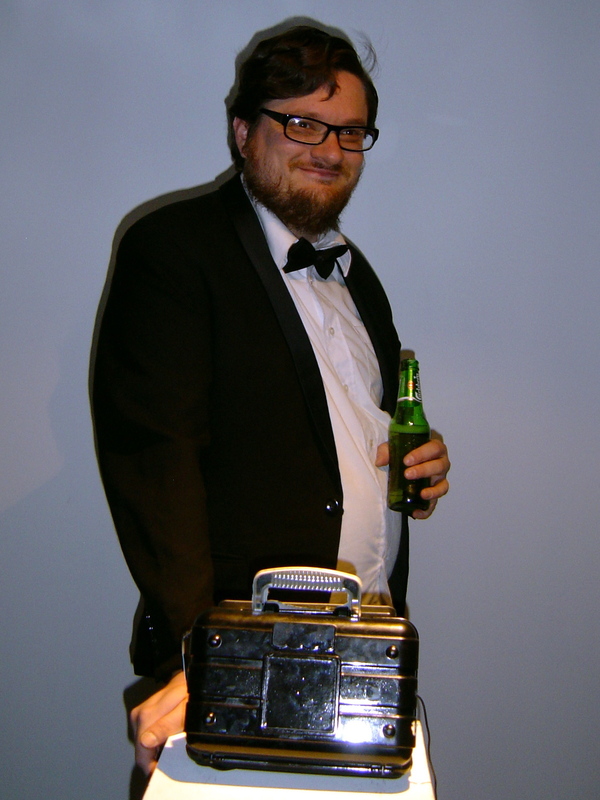 Curator Alister Karl’s theme of the songs Bond movie franchise inspired lots of video art and even some music videos like The Chaotic Order’s take on Peter Gabriel’s song “Sledgehammer” as a Bond theme. Genevieve Piko’s video installation “The Sun Ain’t Shinning No More” showed the influenced of both Bruce Nauman’s “Good Boy Bad Boy” (1985) with the two video monitors with heads and the vacuity of the Bond movie dialogue. “Posted from Nowhere (Or, What Have You Done For Me Philately? )” is an exhibition of comix artist showing a series of stamps issued by the postal system from utopia/dystopia/parallel universes. Curated by comix artist, Jo Waite, the exhibition looks great. The tight theme for this exhibition is great as postage stamps are evidence of the collective consciousness, the official image of the country, some of the best of these retelling Australian history presenting alternative cultural icons. There is philatelic focused art by Neale Blanden, David Blumenstein, Bernard Caleo, Alex Clark, Maude Farrugia, Michael W. Hawkins, Greg Holfeld, Peter Jetnikoff, Mandy Ord, and Ive Sorocuk.